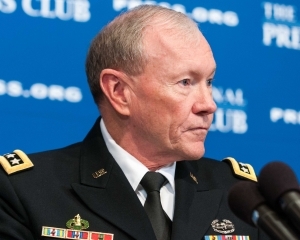 Chairman of the Joint Chiefs of Staff, General Martin Dempsey speaks at a National Press Club Luncheon, October 10, 2012. The “insider” attacks against U.S. and Coalition troops in Afghanistan that have killed or wounded 130 military personnel this year alone are not preventable, but will not jeopardize the mission’s overall objective, Joint Chiefs of Staff Chairman Gen. Martin Dempsey said during a National Press Club luncheon Wednesday. The nation’s defense system’s greatest vulnerability, he said, is the potential of cybersecurity attacks. Rating it a “10” on a scale of one to 10, Dempsey said the challenge also presents a great opportunity for making needed changes to America’s military capabilities. Agreeing that political rhetoric sometimes causes misunderstandings between him and his counterparts around the world, Dempsey said he often personally talks with military leaders of other nations about key issues and assures them that he is not going to communicate with them through the media. Addressing the issue of the rising rate of suicide among military personnel, the chairman said, like insider attacks, suicide is not preventable but the military is trying to do as much as it can to reduce it. He said there is something unknown in society today that is changing the resilience of young people, making them more vulnerable to such acts.